Rejuvenate, Recalibrate and Transform Your Life! Welcome to the Island of the gods, a heavenly transformational experience where the island energy of your adventures, practices, and processes of learning and exploring will align with your highest harmony. Self-love, nurturing the soul, joy, laughter, and fun are our inspirational goals. To learn about self- healing the heart and soul while upgrading your intuition through exploration of this sacred island will be an enchanting Bali Bliss Immersion. This will be a life-changing magnificent memory that will last forever as we rebirth our Bliss! ARE YOU READY TO DEEPLY NOURISH YOUR BODY, MIND AND SOUL? ARE YOU READY TO LET GO OF NEGATIVE THOUGHT PATTERNS AND LIMITING BELIEFS THAT NO LONGER SERVE YOUR FULL POTENTIAL? ARE YOU READY TO FEEL THE BALI SPIRIT OF PURIFICATION AND CLEANSE YOUR MIND AND SOUL? ARE YOU READY TO TRANSFORM YOUR LIFE AND LEARN HOW TO HAVE BETTER LOVING RELATIONSHIPS? “FINDING YOUR FLOW” WILL GIVE YOU NEW PURPOSE AND ASSIST YOU IN EMBRACING SELF-LOVE, NURTURING AND JOY IN EVERY PRESENT MOMENT! GET READY TO INCREASE YOUR VIBRATION WITH YOUR TRIBE!! It is the overwhelming beauty of the Bali Spirit that offers us something so special and unique that does not compare to any other place on earth. Bali reflects a highly defined and rich culture that recognizes the Divine Presence in every aspect of their life and community. This mystical Indonesian destination, with it’s very loving and devotional people will enhance your highly rejuvenating experiences. We will be deeply nourishing your body, mind and soul while immersed in this profound beauty and peace. You will be totally inspired and elevated through the purification water rituals, sacred water temple activations, cacau & sound healing cremony, ceremonial Balinese high priestess readings and blessings all held within a template of restorative rebirth. Nick’s Hidden Cottages, Ubud Bali, Indonesia is beautiful traditional Balinese style family owned resort overlooking sunset jungle views of the Bisma. It will be our first accommodations of 5 nights. It is a non-smoking lush property with pool, restaurant and spa facilities that has a walkway across rice paddies to the entrance. It is located conveniently within walking distance of Ubud village but remains in a quiet haven of jungle surroundings. It is close to all shopping, restaurants and Ubud marketplace. Our twin share room accommodates 2 people comfortably with large bathrooms and a bathtub which is a rarity in Bali. Our private single room is spacious & roomy. Yoga Searcher Eco Yoga Resort in Uluwatu will be our last 2 nights of Bali Bliss near the spectacular ocean views. The bungalows over look luxurious gardens and a salt water pool. Each antique cottage is a unique building in traditional recycled teak wood, offering a slice of Indonesian history. Beyond the entrance terrace is the spacious living area. The bungalows consist of 3 twin beds and a zen inspired bathroom under the stars, Bali style! The sacred water temples of Tirta Empul and Sebatu. An exhilarating water purification bali style. Our Balinese guide will explain the offerings, devotion and cleansing process for your desired intentions. Your heart will smile while laughing with the monkeys and their playful interactions. Our sunrise Mt. Batur crater trek. Soak in the magnificent views of the sleeping Volcanoe. Rejuvenate your body at our jungle spa day. Immerse into the Pyramids of Chi sound healing and sunset fire ceremony. Exquisite beach views, sunsets, sunning, surfing and monkey temple in the picturesque Uluwatu. Victoria Simoneaux has been practicing, studying, and teaching Quantum energy healing -QHHP, body work, and spirituality for over 30 years. She is a multi-faceted energy healer and educator, whose global work has assisted many lives on the path of spiritual awakening and conscious transformation. 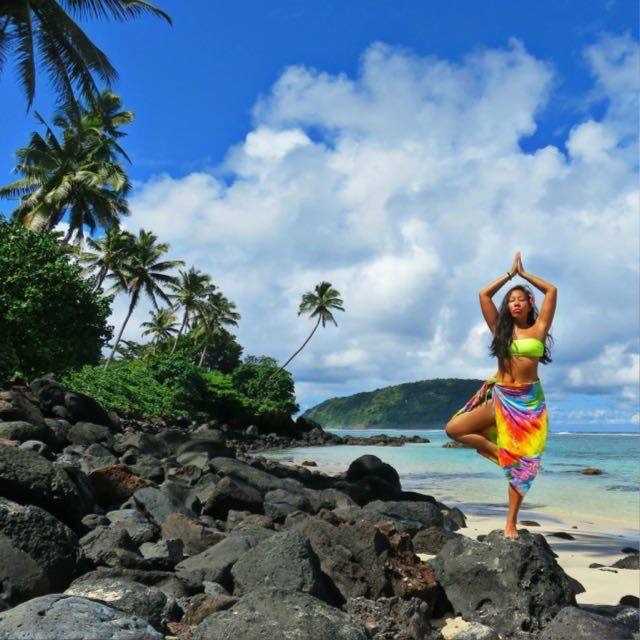 Victoria has been facilitating Yoga and Meditation Retreats for 2 years in India and Bali, Indonesia. Before her world exploration in Asia for 3 years now, she was teaching seminars, workshops and holding group meditations in California. Among others, Victoria is a certified Reiki master, a pranic breath worker, a certified life, health, and spiritual coach, and a certified deep tissue and Thai massage therapist. Including Ancestral Clearings, DNA upgrades and Light-Body dimensional Activations in private sessions. Victoria is greatly influenced by metaphysical understandings, quantum physics, Hindu core teachings, and Buddhist principles. Victoria has been following a yoga practice of many different styles and teachings for over 15 yrs. She now resides in Bali, Indonesia. Also No Refund or Credits for No Show, late arrival or early departure at retreat, injury or illness, weather, natural disaster, travel delays, flight interruptions or schedule problems. Travel Insurance is suggested & available in your country if you prefer.